About: The power of the Wiki compels you. 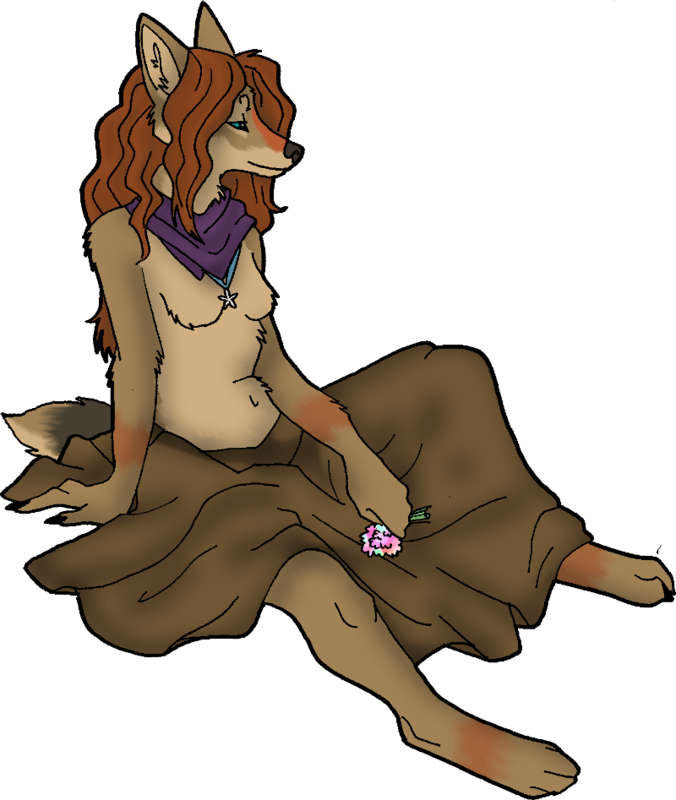 Appearance: Myrika is a coyote-wolf-dog hybrid; she possesses primarily Canis latrans (coyote) blood. She appears to be primarily coyote in facial feature: her ears are large and her muzzle possesses the usual coyote petiteness and tapering. 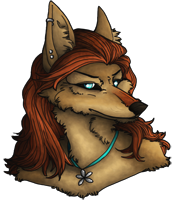 Her size, however, gives clear evidence of her hybrid blood, and her build is extremely wolfish, with little in her physical stature to indicate coyote heritage. However, her facial features, oversized ears and tapering muzzle clearly display her coyote's heritage. She is usually found in Optime form. Personality: Myrika is intelligent -- she was well-educated as a child, and became immersed in books and reading from a young age. Additionally, she is versatile and clever, generally able to adapt to new situations easily. She strongly believes her versatility and intelligence do not exist in social situations. She often doubts and second-guesses her actions, especially where Inferni leadership is concerned. She can be impulsive, acting and reacting quickly without thinking through the consequences. While she idealizes herself as having strong moral convictions, her impulsivity leads her to make decisions contradictory to her morality. Belonging in a group and being accepted by that group is of the utmost importance to Myrika. She enjoys conversation, especially driven and intellectual conversation. While friendly and eager to belong, she is often awkward and anxious in social situations with those she is unfamiliar with. Biography: Myrika Tears and Cassandra Asylum were born to Arkham Lykoi and Rachias Tears de Ame in the spring of 2009 near Thornloe, a small pack in Ontario. Myrika knew her father as Kharma Asylum. Just a month after their birth, their mother departed to seek her former homeland. Kharma raised his daughters, and though the family was friendly with the wolves of Thornloe, they never sought to join. When Myrika was a year old, the trio set out to find Rachias; unfortunately, two weeks into the journey, they were separated. Myrika ended up on a Luperci farm, where she remained until one of the brothers spooks her off. From there, Myrika lives on the outskirts of of 'Souls, unable to continue forward into the strange lands, fearful of the tales of Inferni she knew in youth. An older traveler happens upon her and the two live together for a quite a long time before the man dies. When this happens, Myrika finally gets up the gall to head to Inferni and see what awaits her there, though she has mostly given up hope of finding the family members she'd most like to find. Myrika made her way to Inferni eventually, where she joined in August of 2011. She remained within the pack and participated in such things as the Boreas Conflict in 2012. In June of 2012, her cousin Ezekiel de le Poer stepped down from the Aquila position and left the clan to Myrika. In 2013, Myrika done did a bad thing and slept with Cirael June Lykoi, resulting in pregnancy and the eventual birth of her children, Maeriia Asylum, Kyrios Lykoi, and Vicira Tears. See Character Wiki for more!